Whether at home or the office, we have all heard this phrase in our lifetimes. We have probably even used it ourselves! As early as 50 A.D. the Apostle James wrote that the ability to listen is an important skill in life and relationships. He wrote, “Let every person be swift to hear, be slow to speak and be slow to anger.” (James 1:19). Good advice from the first century A.D but unfortunately still not practiced like it needs to be. I. The World Of Workplace Communication: Increasing Voices, Decreasing Ears! How important is listening in the workplace? Today’s organizations preach collaboration and engagement. They say they want innovative and creative staff who will engage and improve productivity. If that is the case, it means companies and leaders must be prepared to give people a voice. But there is a consequence to giving employees a voice: A company (and its leaders) must listen. Really listen! II. What Is Worse Than Not Listening? Pretending You Did! First and to no one’s surprise, pseudo voice causes communication to shut down. “Researchers chose a healthcare company to be the site of what they said was the first empirical test of the effects of “pseudo voice”. Employees answered questions about their opportunities to voice opinions, the level of regard their input received from management, the methods they used to contribute ideas, and how they viewed their relationships with co-workers. To compare perceptions on both sides, the researchers also surveyed supervisors, who answered the same questions and provided ratings about management’s attitude to employees’ input. Their responses were largely consistent with those of employees. In fact, the supervisors said that they ignored their employees’ input a bit more often than the employees suspected. Second, and more surprisingly, “pseudo voice” increases the amount of conflict in the workplace. III. How Important is Listening In the Workplace? The importance of listening is intensified by the fact that we spend so much time doing it: 75% of our total communication time is spent in people communication, and in the total time we spend in communication, 45% is spent listening to others. IV. Why Don’t We Listen? The problem is we don’t listen very well and there are a variety of reasons that trip leaders up. One of the main factors influencing our inability to listen is that the average attention span for an adult in the United States has dropped over the past decade from 12 minutes to 5 minutes. http://socialtimes.com/is-the-internet-making-our-children-stupid-infographic_b122929. We simply don’t have the patience to hear others out. Finally, leaders don’t listen because they think they know what the employee is going to say and the leader wants to hurry up and get to the point. I heard of a leader who constantly interrupts staff in the middle of a discussion by telling them “I have it”. In essence this leader cuts off further communication on the assumption that they know what the employee is about to say. In a number of instances this has proven to be a detriment to this leader since (s)he did not get the entire story. Truth be told, many managers are not that comfortable in communications. 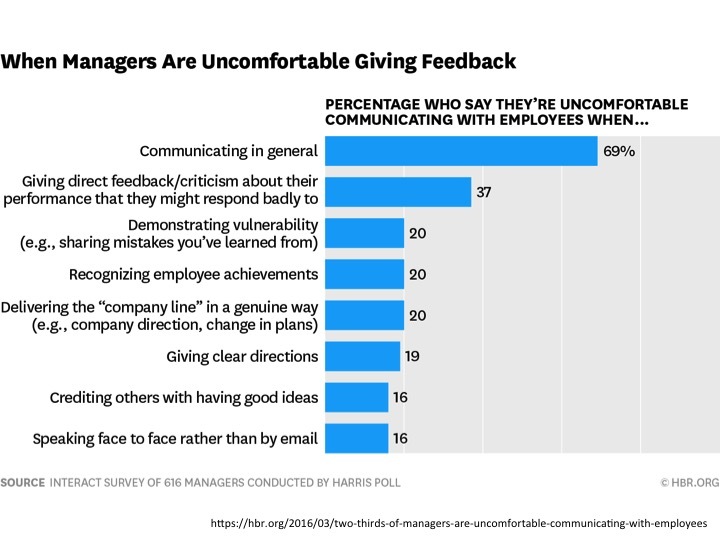 “An Interact survey conducted online by Harris Poll with 2,058 U.S. adults — 1,120 of them were employed, and 616 of the employed people were managers — showed that a stunning majority (69%) of the managers said that they’re often uncomfortable communicating with employees. 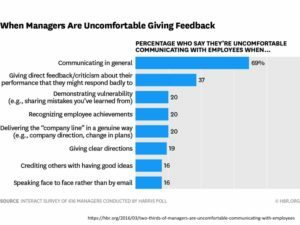 Over a third (37%) of the managers said that they’re uncomfortable having to give direct feedback about their employees’ performance if they think the employee might respond negatively to the feedback. The survey results also showed that many managers are uncomfortable with becoming vulnerable, recognizing achievements, delivering the “company line,” giving clear directions, crediting others with having good ideas, speaking face to face, and having difficult feedback conversations in general”. Leaders may not realize it, but listening underlies all these communication issues. While the importance of listening is being increasingly emphasized and while leaders report that they are uncomfortable communicating with employees, they do not identify listening as an area in which they feel uncomfortable. Perhaps that is the biggest concern: if leaders think this listening is a simple act and one that they do well, then improving this skill will be ignored. We seem to have a situation in which listening, a critical relationship skill, is perceived as a competency that, while important, requires no development. After all, haven’t most of us been practicing the skill of listening all their lives? 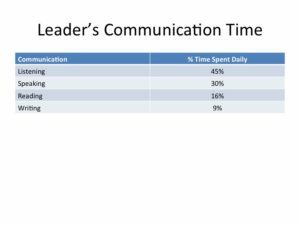 V. How Does Time Spent With The Leader Make Listening Even More Important? “Nearly 50% of people spend 3 or fewer hours per week (@36 minutes a day) interacting with their direct leader. 20% of people spend just 1 hour per week (@ 12 minutes /day) or less interacting with their direct leader. Why is interaction with the leader critical? 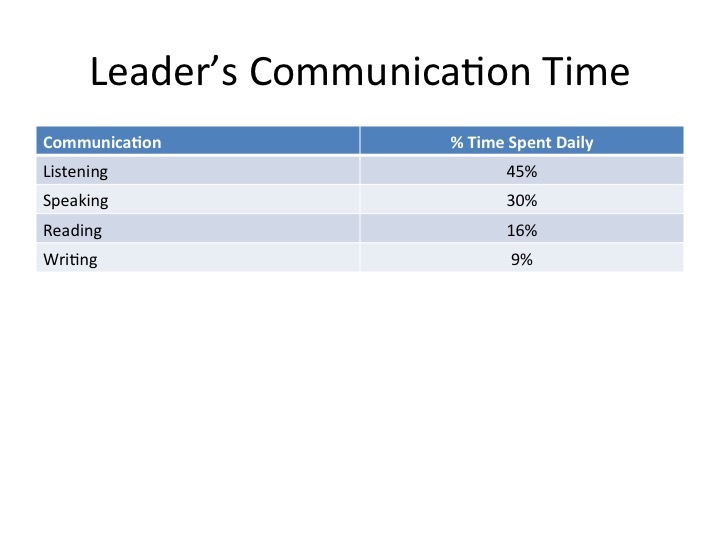 How the leader’s time is spent interacting with staff is interesting. In other words, time with the leader occurs in short staccato like bursts that require the leader to constantly shutout distractions in order to be able to listen – not an easy feat with a thousand things happening at once! This brings up a very important point. If employees are spending 1 hour or less over 5 workdays with their leader, it is critical for both the leader and the employee to listen. The opportunity is too rare to waste. For those spending 6 hours a week with the leader it is essential to listen since such a huge investment is being made in these individuals. Since leadership is all about getting work done through others, the ability to work with people is essential. Simply put, working with and through people requires the ability to listen and understand others. Thus, listening is a critical workplace skill. In order to be able to listen, we must first understand how people communicate. For many, listening involves only hearing words – what people say. But people communicate through many different channels. If we don’t understand how others are communicating their message, it will be difficult to know to what one should listen. People communicate through words. They use words to describe their ideas, needs, wants and opinions. Sometimes this is done skillfully, sometimes not. Sometimes the words that are chosen create anger or bring up negative emotions rather than present a professional point of view. To be an effective listener, people use their ears to listen to words that convey a message. The leader may not like or appreciate the words that are used but that is not the leader’s first concern. (Note. The choice of words may have to be dealt with at some point but if a leader cuts a person off in the middle of his or her sentence to address word selection, the ability to understand the message is jeopardized.) The leader’s first concern is to listen to and understand what the person is trying to say. Interestingly enough, research indicates words communicate about 7 % of the message conveyed. As a society we are losing out ability to read people’s emotions, at least until it is too late. Technology teaches us to pay attention to words (text, e-mail, etc.) and to ignore other means by which the person is communicating. So leaders must pay attention to emotions because people do not just select words, they often communicate them with emotion: anger, passion, hope, fear, excitement, etc. The effective listener listens to the emotion behind the words. This helps the leader determine what the person is truly saying. 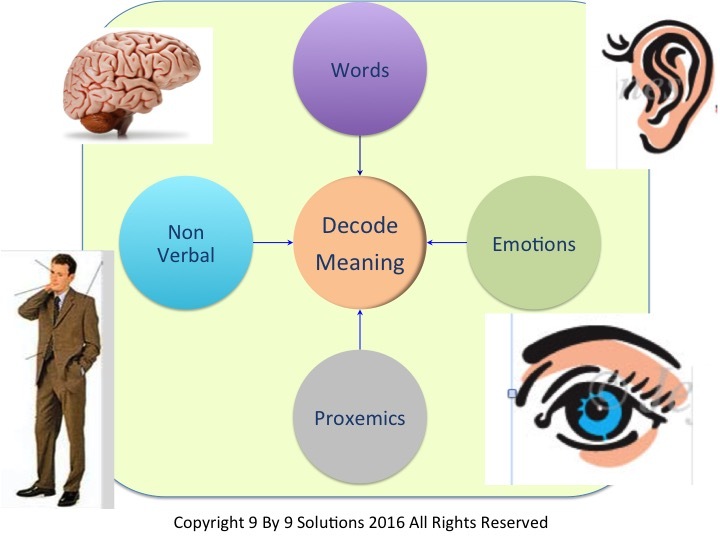 Research indicates emotions communicate 38 % of the message conveyed. People communicate non-verbally. They present a message by their facial expressions, by the tautness of their face or how relaxed they stand. Clenched fists are always a telltale sign too! Non-verbal communication can reinforce a message conveyed by words or emotion or it may contradict the words the leader is hearing. 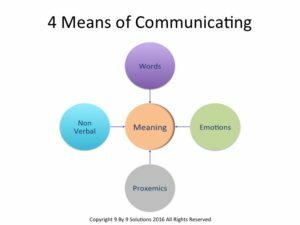 In any case a leader that ignores non-verbal communication may in fact address the issues presented by another’s spoken words only to find later that they have missed the core message. 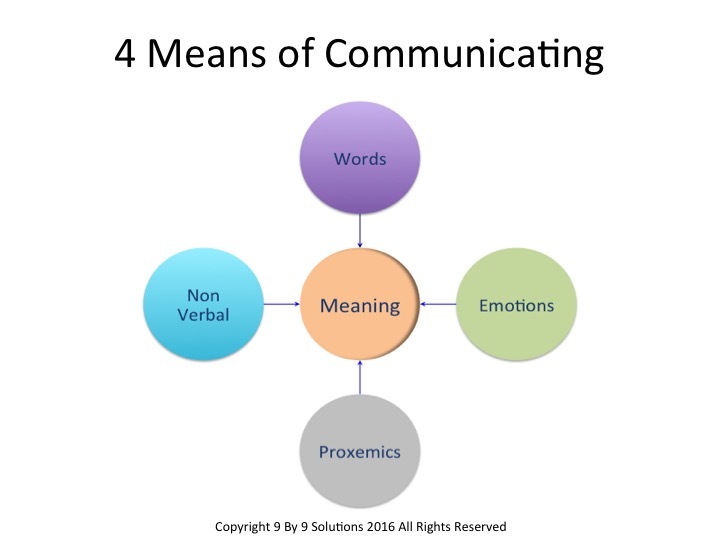 Research indicates non-verbal communication communicates 55 % of the message conveyed. This means one of the most critical parts of listening to what a person is saying involves observing their non-verbal communication. Proxemics is the study of the way a room is arranged. We have all tensed up when we are called into our boss’s office to find the normally jovial boss sitting behind his or her desk and telling us to take a seat across opposite the desk. The desk communicates authority and seriousness. People communicate by where they stand and how they arrange the furniture. A person may express disgust with a leader by standing across the room and being unwilling to move closer. Conversely, a person can convey too intimate a relationship by standing too close. In any case, the effective listener pays attention to the setting in order to understand a person’s message even further. All of these communication channels are used to communicate a message. The effective leader listens to the messages coming through all four of these channels and integrates them to discern the message. Just as messages are sent in a variety of ways, listening occurs through variety of channels. The more of these “listening channels” that are used, the better the chance a leader will truly listen to another person. Obviously leaders use their ears to listen but the ears get a bad rap. It is usually not the sound of words striking the tympanic membrane that is the problem. Often, however, the ears hear, but they do not listen. The ears take in the words and they may sense the emotion with which the words are communicated but that is only part of the battle. It is in the mind that true listening occurs. This is where the leader pays attention and processes information that is received. It is where the leader’s preconceived bias about the issue, the employee and about their words in the message are considered. It is where priorities exist that case the leader to focus to or unfocused on what an employee has to say. It is where information from non-verbal communication and emotions are aligned with the words that are said to assess the meaning. •	Take in information from all channels without judgment and pre-conceived bias and with appropriate time for the send to articulate their message. •	Align the messages to determine the true message of the sender. •	Summarize with the sender the message prior to responding. As leaders listen they must be cognizant of their non-verbal communication. Just as an employee communicates through non-verbals like the clenched jaw or tensed body, so does the leader. These non-verbal are read by the employee. They determine how the employee thinks the leader is listening to the message being sent. When the leader’s non-verbals are not compatible with the real listening, leaders communicate to the employee that the employee may have gained the leader’s time but they do not have the leader’s interest. •	One of the most important things leaders can give employees is their time. Time is most often given in the form of listening. To understand the importance of time we must realize it includes more than the leader’s physical presence. It means that for a short interval a leader provides their undivided attention to listen and understand employees’ perspective and point of view. By listening with ones ears, eyes and brain the leader affirms the employees worth and value both to the leader and the organization. Out of this affirmation, engagement and commitment grow. To give an employee time but then take it away by not listening (paying attention) communicates to the employee that they are of little value to the leader or the organization. (This is one of the reasons that one bad supervisor or manager can so impact the perceptions of employees of an otherwise reasonably good leadership team). However, the difference between effective and ineffective leadership is found not in the asking for feedback but in acting on feedback. That requires listening. Listening is not a one-way street. It is also critical for employees. •	Leadership IQ found that 46% of newly hired employees would fail within 18 months. Of those that fail, 26% do so because they can’t accept feedback. So if collaboration and engagement are the wave of the future, somebody better start listening or we will continue to produce a chorus of voices with no one to listen to the message! Dear Doug, a fantastic article. It gives right information and adds a great value to the leaders if they understand and apply the right communication process. Thank you for sharing such valuable, scientific and practical article.